Elections are coming up next year, so we will probably see more spending. President Mahama has a lot of work on his hands in the lead-up. I imagine he will cite progress made on addressing power issues and the exploding budget, and that he should be re-elected to continue righting the ship. Elections are a lot of work. Perhaps, the better move would be to not seek re-election, double down and get reforms right over the next 18 months, and hand off an improving situation to his successor. Never have I been so excited about chickens! Earlier this year in Uganda, I and Sydney Musonda developed a business model for a chicken farm he would run in Zambia. He spent the next five months pursuing financing for his venture and secured funding in November. To date, he has purchased 205 day-old chicks and secured a facility to house them. He will be ready to make his first sales at the end of January. Sydney and I recently caught up on his venture and our conversation reinforced two things concerning entrepreneurship. The first is that the external environment, both political and macroeconomic, will always make things challenging for entrepreneurs. The second is that entrepreneurs can leverage these kinds of challenges to grow their confidence, brand, and business model. During the five months Sydney spent pursuing funding, he had a difficult time getting potential investors to buy into his idea. He got a significant amount of great feedback on his model, yet the investors he approached were having difficulty with their finances and were concerned about the political environment in Zambia at the time, it being an election year. Zambia is one of the better performing economies on the African continent, with its current $16.19 billion GDP projected to grow at an average rate of 6.9 percent between now and 2015, though the country is still trying to make sure that growth is inclusive. Like most of the world though, the economic crisis in the European Union is surely having an impact Zambia’s economy as well. The country seems to have transitioned well to President Michael Sata’s administration and Patriotic Front party after President Rupiah Banda’s three-year term and the Movement for Multi-Party Democracy’s 20-year control of power. In the months leading up to the election, there was tension on the ground. Sydney shared that one of the banks was taken over by the Zambian government showing that their concern was not completely unfounded. Despite the challenges he faced, Sydney says that his confidence continued to grow pitch after pitch. He was able to glean advice from the investors he approached and found the feedback helpful in refining his model. In the face of his disappointments, he did not give up and finally secured his funding. 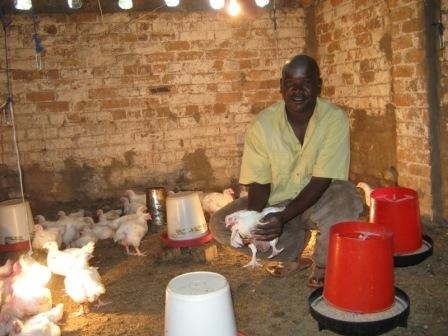 Sydney is launching his business at what seems to be a promising period in Zambia’s poultry industry. Mathews Ngosa, President of Poultry Association of Zambia, noted that Zambia’s poultry industry closed at 2011, having produced 40 million broiler chickens and 2.1 million layers. He projects production growth to land between 20-25 percent, a marked difference from the 40 percent reduction in growth the country experienced in 2009, and an increase from the 17.5 percent growth in 2010. I look forward to watching Sydney grow his business. The energy in his voice was so infectious as we spoke, and I am really excited that he has progressed this far with his venture. I am sure he will face further challenges considering that his venture is still young but I think his tenacity will help him drive the business forward.